Recorded at concert halls, churches and yoga studios as Snatam Kaur and her ensemble traveled across North America, you’ll hear performances which soar to the heights of these sacred spaces and find a home in the hearts of their audiences. Join in the magical experience of Snatam Kaur Live in Concert. Also includes a bonus DVD, Path of Peace, that intimately chronicles this tour. 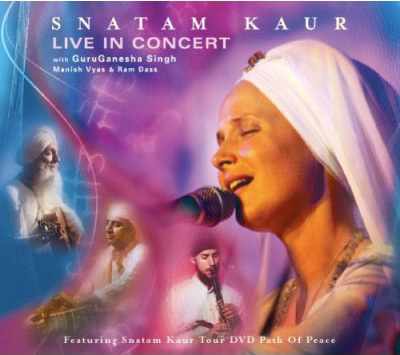 This album fulfills years of requests for Snatam Kaur to capture the experience of her live performances on CD. There is something mystical that happens at her concerts that is represented in these songs. The album opens with Azure Salver, a prayer translated in the book Peace Lagoon. This song has been a favourite at her concerts, but has never been recorded before. This song is hilighted by the clarity of Snatam's voice, the poetry of the lyrics, and the expert instrumental accompaniment. The live version of Snatam's Ong Namo takes the recorded version into the ethers. Sometimes when Snatam is on stage, she goes into a deep meditative space and spontaneously weaves improvisational poetry into the songs. Ong Namo has a beautiful example of this. On Ong Sohung, Gobinda Hari and Adi Shakti, the dynamic interplay of the entire band is hilighted to perfection with incredible musical conversations between Snatam Kaur, Manish Vyas and GuruGanesha Singh, fantastic solos on guitar, violin, tabla and clarinet, and the lively experience of a slowly building rhythm that is unique to the live kirtan experience. Shivohum is a track composed by Manish, and you will be singing this track for years to come. A beautiful duet between Snatam and Manish, this track has an an addictive energy and purity of sound that you will want to listen to again and again.